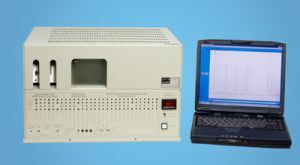 Product Description The Buck 910 gas chromatograph is Multi-detector system and can accommodate multiple injectors and detectors. There are 9 specific detectors available for the Buck 910 GC, and it can accommodate 4-6 detectors, depending on your combination. Price is for base unit, without detector(s). Below are various detectors - add prices of desired detectors. In the lab, the Buck Scientific 910-series GCs perform routine industrial analyses and complicated research separations easily, generating accurate and reproducible results. The unique architecture of the Buck GC systems allow various detector and injector combinations, so each GC can be configured to meet your specific lab requirements. 1) TCD (Thermal Conductivity Detector) - A "universal" detector able to measure almost ALL molecules; inorganic and permanent gases as well as organic vapors. Operates below 275oC, and gives a typical DL of ~250PPM, with linearity to ~100% for most species. A good nondestructive detector for general Organic and Analytical testing, it is also used for Combustion Gas and Stack Gas testing, Atmospheric monitoring, and bulk measurements. Helium is the recommended carrier. 2) FID (Flame Ionization Detector) - Commonly used for Organic analyses, it is specific for Hydrocarbon species with a working range from ~10PPM to 10% for C1-C10 compounds. It has a high temperature range, over 400oC, and can be interfaced with add-on detectors for selective-species measurements. Solvent and material characterization, environmental samples, TPH and petroleum analyses are primary applications. Air & Hydrogen are support gases, using Helium for a carrier gas. 3) DELCD (Dry Electro-Lytic Conductivity Detector) - This detector, with FID, is ideal for environmental applications where Halogenated Hydrocarbons and Pesticides can be easily differentiated from Solvent matrix backgrounds. Cleaner and more linear response of DELCD compared to ECD still gives sensitivities in the 10PPB range; and meets most EPA specifications for the 600- and 8000-series methods. Works best using Helium for a carrier, with Air & Hydrogen as supplemental gases. 4) HID (Helium Ionization Detector) - Provides "universal" detection; and is non-destructive, similar to TCD; for gaseous species with an Ionization Potential below that of Helium. Less expensive than similar detectors; it provides DLs of ~1-10PPM for most gases. Suited for special tests; such as Transformer Oil Gases, Road Bed Emissions and other non-Organic vapor measurement. High-quality Helium is required as Carrier. 5) NPD (Nitrogen Phosphorus Detector) - Designed for Agricultural and Drug testing, this modified Thermionic Bead Detector responds to Nitrogen-bearing compounds to concentrations of ~100PPB or lower; with Phosphorus-containing materials detectable at ~500PPB. As part of an FID assembly, it needs the Air-Hydrogen jet to burn the eluting "peak" with a Helium carrier. 6) ECD (Electron Capture Detector) - Originally designed for single PPB level detection of Chlorinated organic compounds, it requires a special carrier gas of Argon-Methane and low-bleed columns for optimal results Still the most sensitive detector available for the environmental monitoring of Halocarbons and Pesticides, with 1-5PPB detection limits. Usually run independent of other detectors. 7) PID (Photo-Ionization Detector) - A high-intensity "UV" source, the 10.6eV Krypton Lamp generates powerful energy to "excite" UNSATURATED organic; such as Aromatics, Olefins, Ketones and Esters. The low 10-50PPB DLs for the Aromatic compounds make it ideal for environmental testing for BTEX, PAH and PNA species. Non-destructive measurements make it ideal for use with an FID/combo detector. 8) FPD (Flame Photometric Detector) - Employs either a single- or double-phototube detector that "sees" the light from burning Sulfur or / and Phosphorus compounds. Crucial for Stack and Combustion Gas testing,Natural Gas, refined Hydrocarbons and even Pesticide materials. Superior detection limits in the 1-10PPB range are achieved with advance electronics and proprietary optical designs. Uses a rich Hydrogen flame, often used in conjunction with FID and with a Helium carrier gas. 9) CCD (Catalytic Combustion Detector) - A unique and economical alternative to the FID for the detection of hydrocarbon compounds has a typical detection limit of about 500 ppm when run with a helium carrier. The CCD can also run at lower temperatures (<200) when run on air to make a truly self-contained GC.